You know those friends that you only see every few years, but when you do it's like you were never apart? This recipe comes from one of those friends in my life. She is one of the smartest, patient and compassionate women I've ever known. She was a bridesmaid in my wedding, and will be a fixture in my heart forever. I should call her. 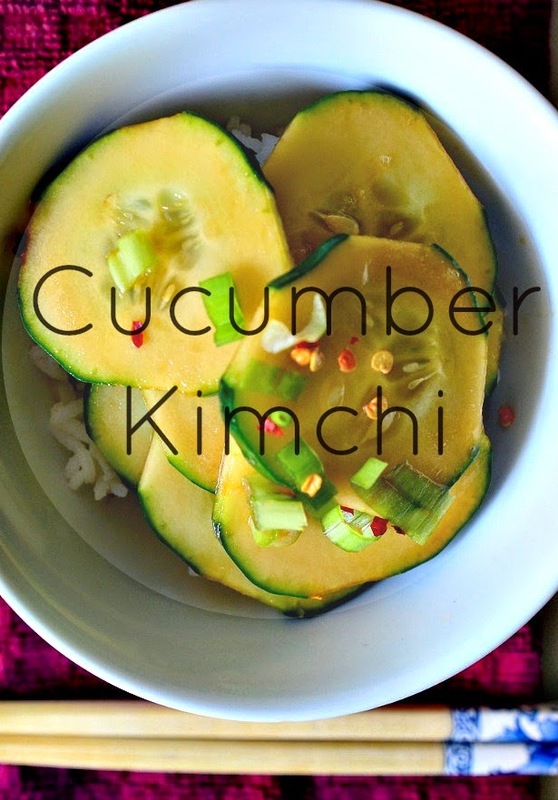 Cucumber Kimchi is incredibly refreshing, and it comes together so quickly you won't even believe it. 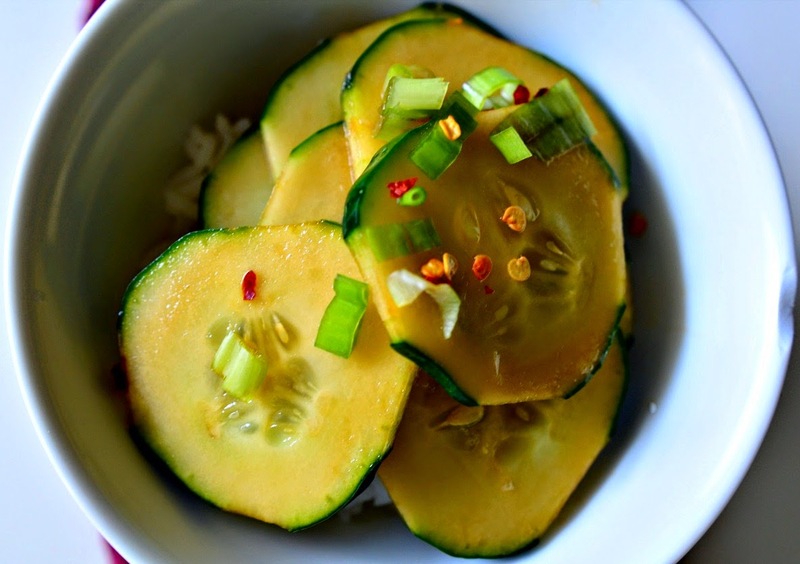 The sensation of the cool cucumbers against the hot white rice is a real delight. Actually, rice was once a point of contention between my friend and myself. I wanted to try the kimchi with brown rice, but she insisted that it wouldn't work. I served it with brown rice anyway a few times before sadly admitting that she was right. Brown rice is too flavorful, non-absorbent and un-sticky. You need the clean flavor and stickier nature of white rice to get the full experience. My husband and I like to boil up a bag of edamame to make this a full meal. I'm sure I've unintentionally changed the recipe over the years, but it remains delicious and always makes me think of my longtime friend. 1. With a peeler peel alternate lines in the cucumber like this. Slice the cucumber into thin slices. 2. Place the cucumbers in a shallow bowl and add the garlic, scallions and red pepper flakes. Stir to combine. 3. Pour enough soy sauce over the cucumbers until they're well doused. Not totally submerged, but well covered. 4. Refrigerate until ready to eat - at least 20 minutes. I like to make the kimchi right after I put my rice on, and let it marinate while the rice cooks. 5. Serve cold with cooked hot white rice. Hi! I'm Hannah and I cook a lot, I eat a lot, and my goal is to have a home as clean as the dickens. I hope to show that there are plenty of ways to incorporate cruelty free practices into every day life whether you're vegan or not. Welcome! Disclaimer: Housevegan.com is a participant in the Amazon Services LLC Associates Program, an affiliate advertising program designed to provide a means for sites to earn advertising fees by advertising and linking to Amazon.com. Follow me on IG for behind the scenes realness! Follow House Vegan on Pinterest. All content on housevegan.com, including recipes and photographs, is owned by Hannah Teson. Unauthorized use of recipes and writings published on housevegan.com is strictly prohibited. Use of this site's food photography is permitted with proper credit to Hannah Teson and a link back to the original content on housevegan.com. Permission is required for use of non-food images.